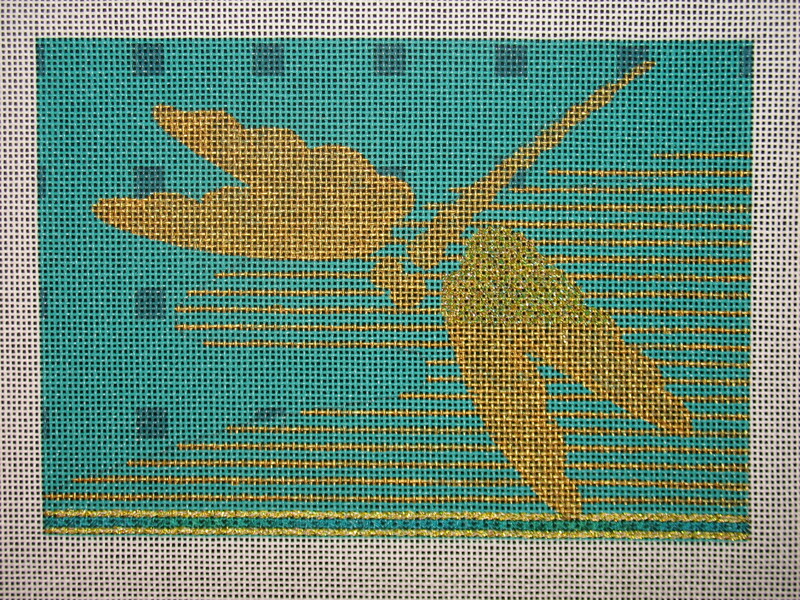 Dragon Fly is a Kathryn Molineux painted canvas that I selected at Nimble Needle for a class with Sharon G who provided the stitch guide. I’ve had this done for a while & was enjoying looking at it but I can only keep so many pieces. So, this went to Anita, another coworker for her birthday! And, now everyone I work with has gotten something I stitched. The design was exactly 5″ X 7″ & Michael’s cut the mat to fit exactly. 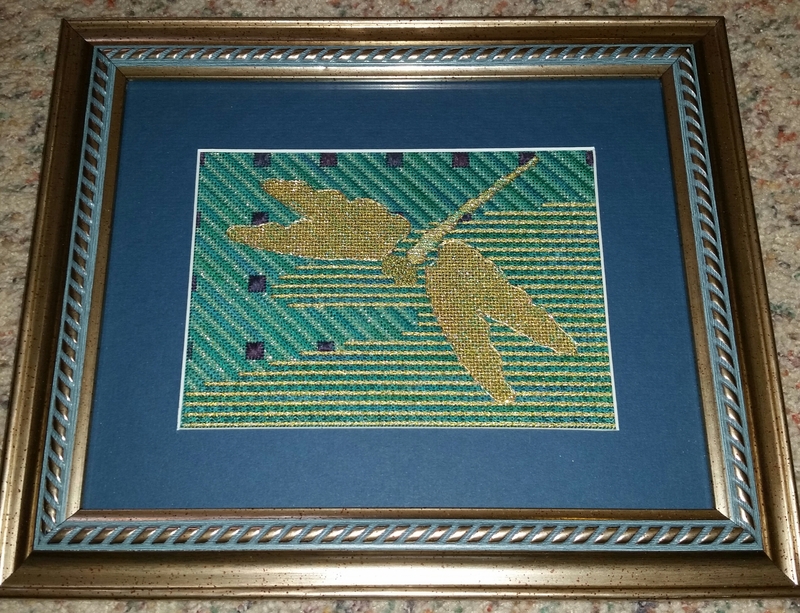 I really got lucky with the color of the frame matching my design – also from Michael’s! I just cut the canvas down & left it unblocked. There isn’t the same amount of space in this type of frame to add another layer of thickness. 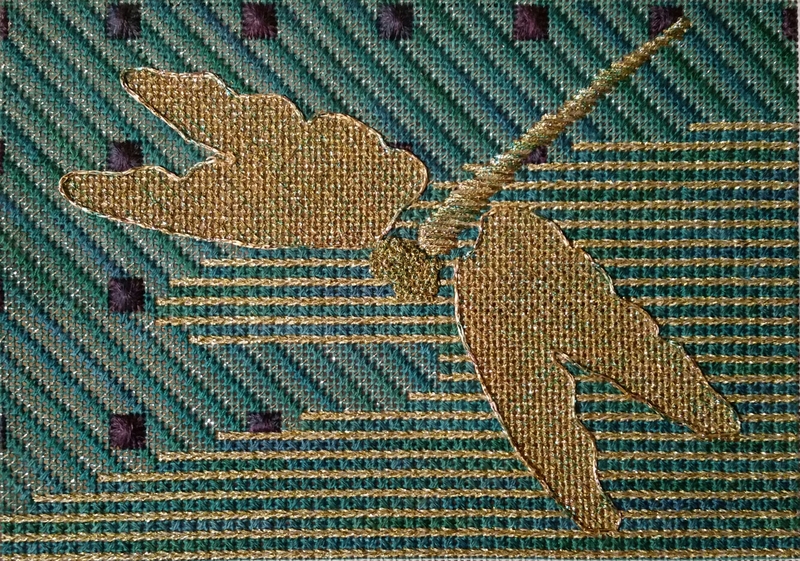 And, my stitching doesn’t pull the canvas out of shape anyway – so, it should be fine. 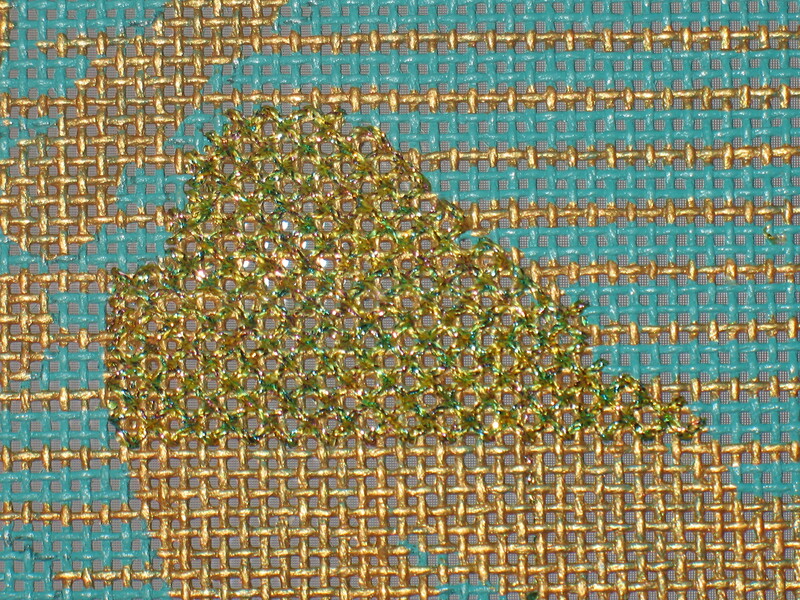 I had to make a trip for more Kreinik #4 braid 3228, a yellow gold with a hint of green for the single gold rows That uses a Van Dyke stitch over 1 and 4 threads. 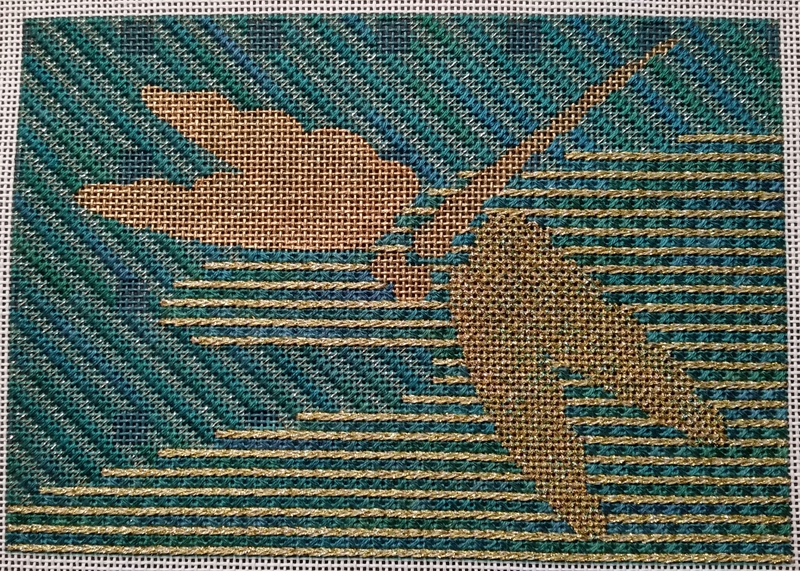 In between those rows are Alternating Mosaic using 2 strands of Gloriana #192, Peacock Blue which I am using a laying tool. 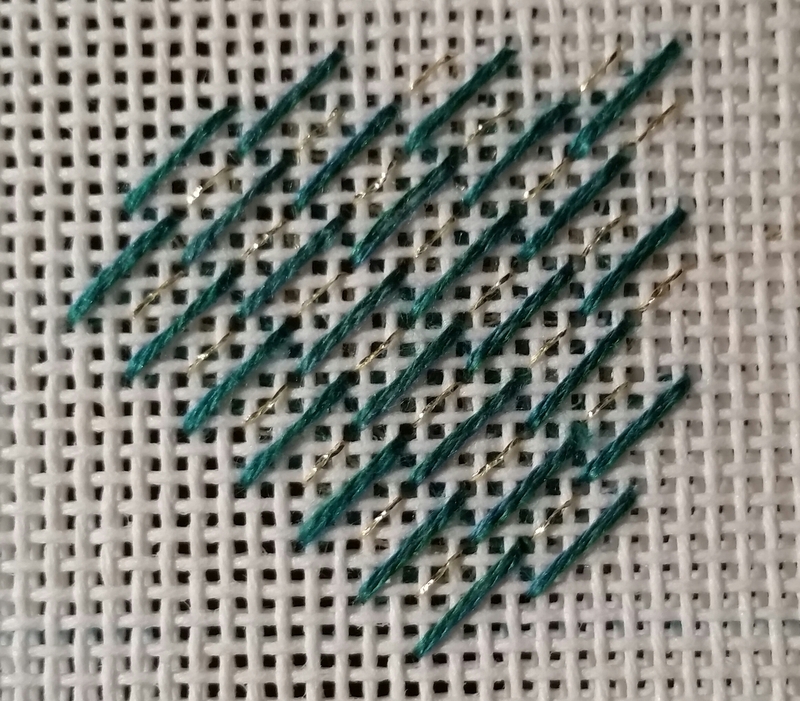 It’s not may favorite thing to do but it looks sloppy if you don’t – even with just 2 threads. I love getting a section done! I think I’ll go back to the wings next. 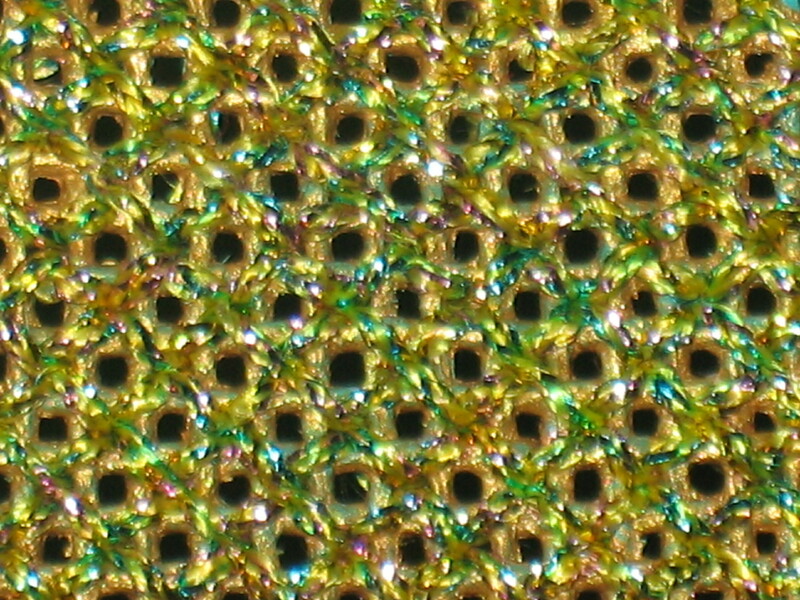 Alternate gold/green – Kreinik/Gloriana for variety. Last weekend, I found a SharonG canvas that will go perfectly as an insert to a black purse to carry with one of my winter coats which has 2 snapdragon pins. But, Karen at Nimble Needle offered me a discount on a returned stitch guide/threads packet for that canvas (subject of another blog another time!). So, I had to find another canvas that didn’t have a stitch guide to take to the canvas enhancement class today! That wasn’t too hard with so many pretty canvases! Today (actually took me longer to write this up & it is technically now Sunday), I worked on a green/gold Dragon Fly canvas by Kathyrn Molineux for a Sudberry House wooden tea-tray. The pictures are showing the canvas more blue – I wish I could adjust that aspect. It is a 5×7 design area on 18 count. But, I’ll need to expand past that for the 5&3/4 x 9&3/4 area of the tea-tray. SharonG recommended a bamboo border to fill in which I won’t get to until last. Also, she recommended a gold Mylar or Lurex underneath to be reflective which I’ve never heard of that before-sounds facinating. I met a nice bunch of fellow stitchers from all over NJ, PA, & MD. We talked Seminar classes – everyone is excited! And, we had a lovely lunch at The Bistro which was a short walk on a beautiful day. Quite a pleasure to finally meet SharonG! Hopefully, I’ll get her class, Anatomy of a Stitch Guide, at Seminar. 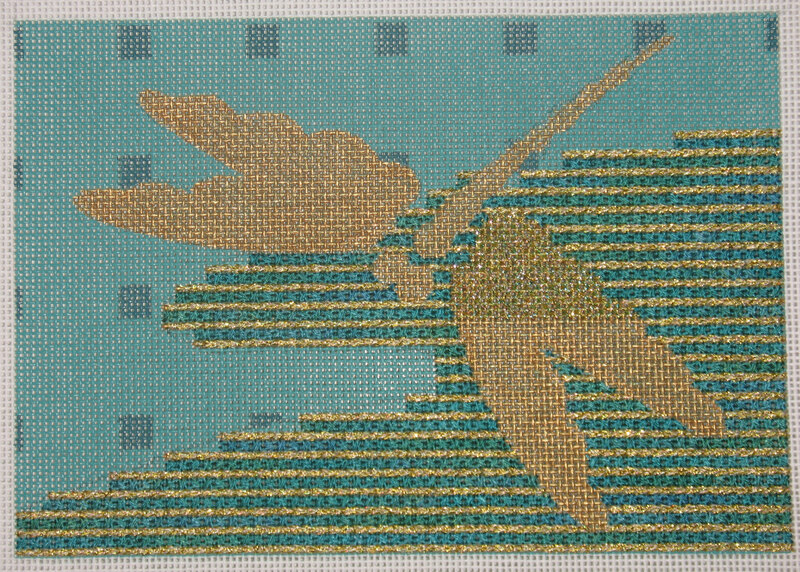 When I got home & looked at SharonG’s book Needlepoint SENSE (Simply Essential Needlepoint Stitch Explanations), I realized that the Alicia’s Lace that Sharon recommended for the gold wings on the Dragon Fly would let the gold of the canvas show more & allow the reflective layer to be effective. 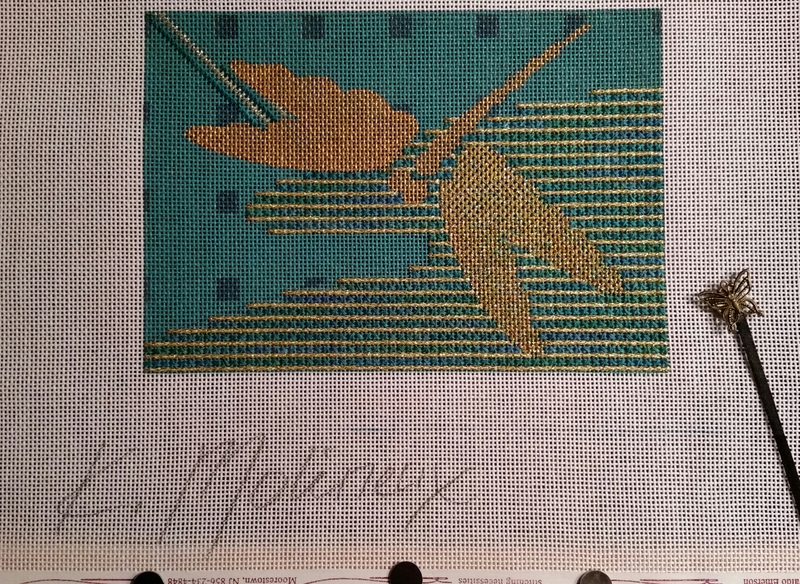 So, I ripped out the Alicia’s Lace Variation that I’d started on the wing because it covered too much canvas. I hadn’t done much & didn’t realize that they’d be so different. The hardest part about the Alicia’s Lace is starting and ending your thread so that it doesn’t cover the holes from the bottom. Here’s a picture but if you click on it you’ll see the white underneath the holes. And, with the flash off, you can really see through the canvas. 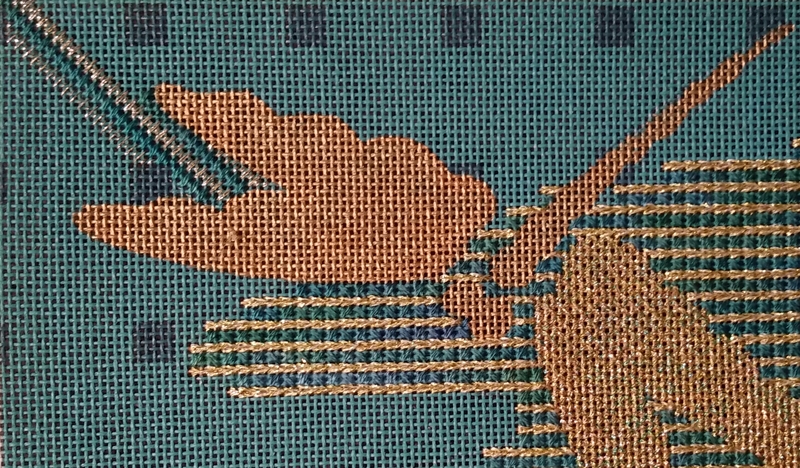 You can see where I am finishing off the threads on the left. I have to run a border thread around the wing & couch it anyway – so, it’ll be fine. Back to front with flash for close-up. 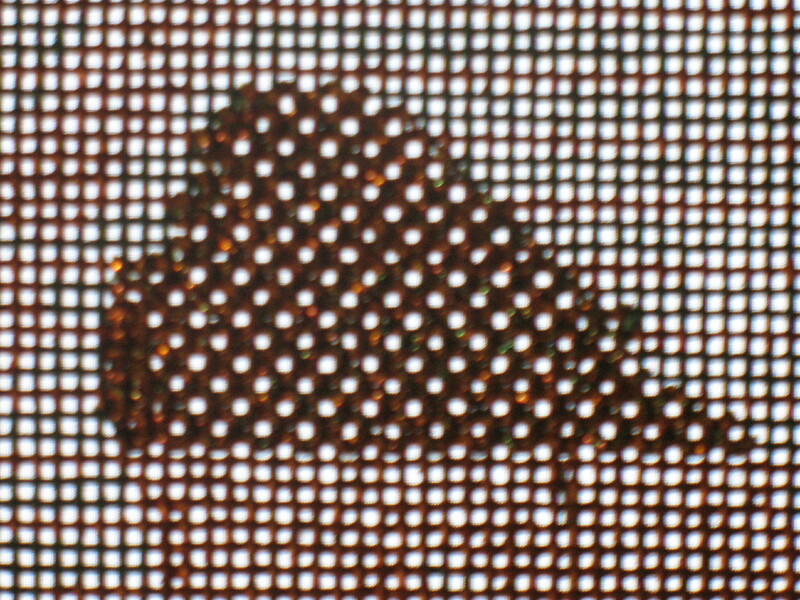 There is only one hole in upper left corner that is covered by a thread from the back in this picture. 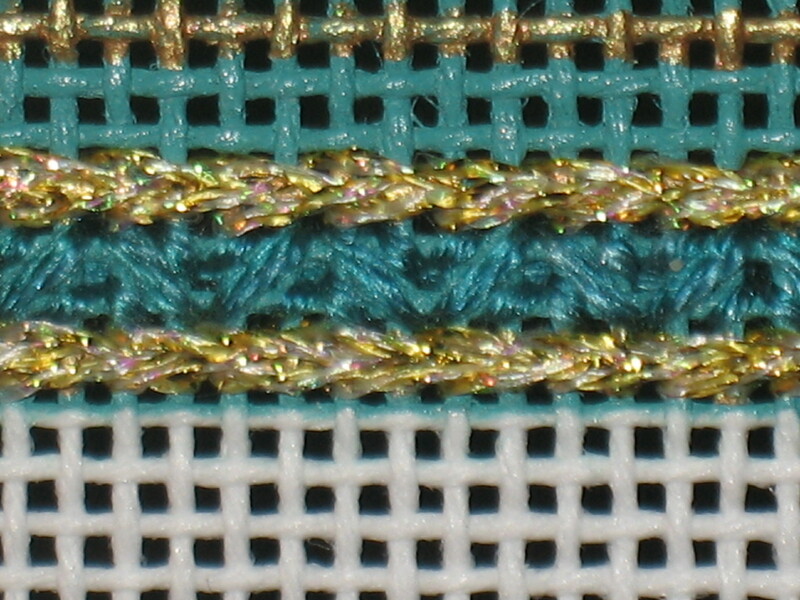 The single gold rows are a Van Dyke stitch over 1 and 4 threads using Kreinik #4 braid 3228, a yellow gold with a hint of green. In between those rows are Alternating Mosaic using 2 strands of Gloriana #192, Peacock Blue (again that looks more green than here), a 12 strand hand-dyed silk. I was going to use Watercoulors or Waterlilies but Sharon likes open stitches to allow the painted canvas to show through. I never used Gloriana before-it’s nice. I caught up to where I was at the end of class. You can sort of see the green along the bottom row in this picture.